Oh wait, my blog post. So...yeah, I'm an extremely visual person. I've learned that the best way to manage your wardrobe is to figure out both your good and bad habits and work backwards from there. For example, I have an unreasonable amount of clothes and I for some reason have a serious problem with hanging clothes in the closet. I don't know why, maybe I just like looking at them. So with that in mind, I bought a garment rack that lives in my room where I hang new things so that I remember to wear them and I also go through my closets and put things out that I find inspiring or that I might want to wear on the blog. 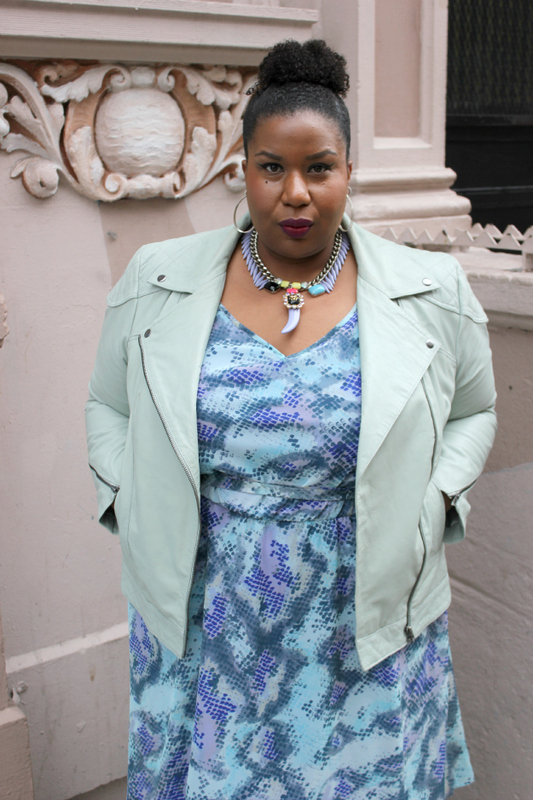 I purchased this multi color snake print dress from Lane Bryant last summer. I knew I liked it but couldn't really envision how I wanted to wear it. 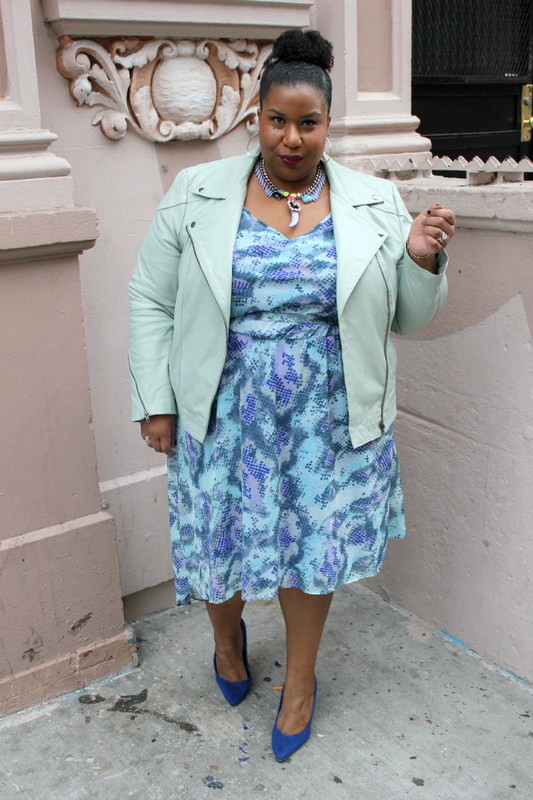 That is, until this more than amazing minty green leather jacket from ASOS Curve made it's way into my life. The jacket was hanging on a hook outside my closet door and the dress across the room on the rack. 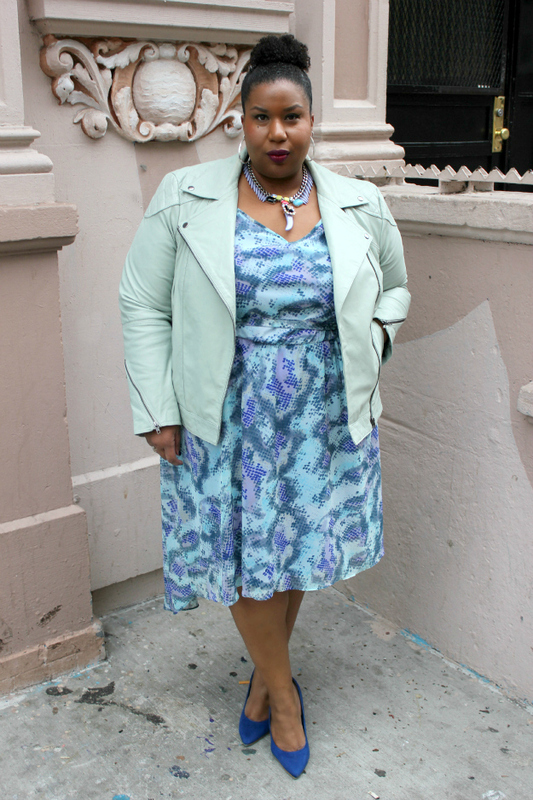 I looked at the dress, turn to the jacket, back to the dress and then the jacket again. YES! That's it. Yeah, I actually was that excited. I loved my winged liner more than a little bit...haven't worn it this way in ages, making a 2013 comeback!